Hammertoe deformity is the most common deformity of the lesser toes. The fundamental problem is a chronic, sustained imbalance between flexion and extension forces applied to the lesser toes. These imbalanced forces involve intrinsic and extrinsic tendons of the foot. With progressive proximal interphalangeal (PIP) joint flexion deformity, compensatory hyperextension of the metatarsophalangeal (MTP) and distal interphalangeal (DIP) joints typically occurs. The hyperextension of the MTP joint and the flexion of the PIP joint make the PIP joint prominent dorsally. This prominence rubs against the patient's shoe and may progress to cause discomfort. Metatarsal shortening has gained renewed interest, but PIP joint resection arthroplasty and tendon transfers are the main procedures for hammertoe correction. The lesser toe comprises three phalanges that articulate at the PIP and DIP joints. 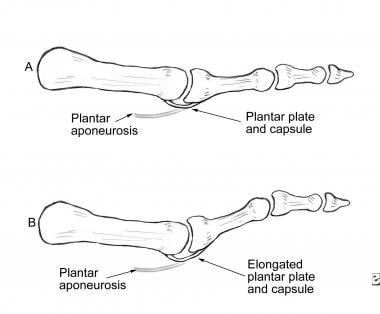 The proximal phalanx articulates with the metatarsal at the MTP joint. Medial and lateral collateral ligaments, a fibrocartilaginous plantar plate, and a thin dorsal capsule stabilize each of the three joints. The extensor digitorum longus (EDL) tendon originates in the anterior compartment of the leg and crosses the ankle anteriorly. Although it extends all three joints of the lesser toe, it primarily acts at the MTP joint. The extensor digitorum brevis (EDB) originates at the dorsal surface of the calcaneus and blends with the EDL tendon over the proximal phalanx to form the extensor expansion. The flexor digitorum longus (FDL) tendon originates in the deep posterior compartment of the leg, crosses the ankle medially, and flexes all three joints of the lesser toes, though it acts primarily at the DIP joint. The flexor digitorum brevis (FDB) tendon originates from the plantar surface of the calcaneus and primarily flexes the PIP joint. The lumbricals originate from adjacent FDL tendons, pass plantarly to the MTP, and then extend dorsally to coalesce with the lateral bands. Thus, the lumbricals flex the MTP joint and extend the PIP and DIP joints. The neurovascular bundles of each toe arise from a common interdigital artery and a common interdigital nerve. Each bifurcates at approximately the level of the MTP joint. Each branch then extends along the medial and lateral aspects of the toe deep to the subcutaneous tissue. Both the interdigital artery and the interdigital nerve are plantar to the intermetatarsal ligament at the level of the MTP joint. Both can become contracted in a chronic hammertoe and are subject to traction injury with hammertoe correction. The fundamental problem is a chronic, sustained imbalance between flexion and extension force of the lesser toes from intrinsic forces, extrinsic forces, or both. 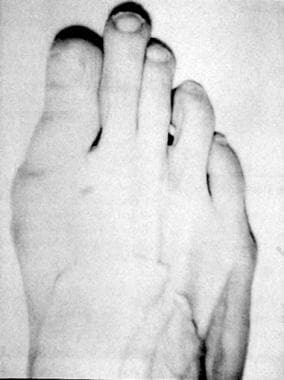 Hammertoe deformity primarily involves flexion deformity of the PIP joint of the toe, with hyperextension of the MTP and DIP joints (see the image below). 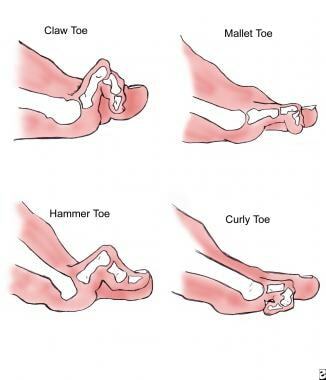 Diagram comparing clinical appearances of lesser-toe deformities. Pathomechanics of hammertoe deformity. Elongated plantar plate, caused by either metatarsophalangeal (MTP) synovitis and instability or chronic MTP hyperextension due to toe crowding, results in MTP subluxation or dislocation with compensatory proximal interphalangeal (PIP) flexion. With all three of these etiologies, the EDL tendon gradually loses mechanical advantage at the PIP joint, as does the FDL tendon at the MTP joint. The intrinsic muscles subluxate dorsally as the MTP hyperextends. They now extend the MTP joint and flex the PIP joint, as opposed to their usual functions of flexing the MTP joint and extending the PIP joint. Morton foot, wherein second ray (metatarsal and corresponding toe) is longer than first ray. MTP joint synovitis and instability are associated with a second ray that is longer than the first. Inflammatory arthropathies typically involve more than one of the lesser MTP joints. Ill-fitting shoewear compounds the effects of any of the other causes. The incidence of hammertoe deformity is undefined. However, the condition is strongly associated with the presence of a second ray that is longer than the first, and it is known to be more common in women and to increase in frequency with advancing age. Indeed, this length disparity is found in most patients presenting with foot complaints, though the actual prevalence of this foot shape also is undefined. Although nonoperative treatment of hammertoe deformity often successfully alleviates pain, the deformity typically progresses in magnitude and stiffness despite diligent nonoperative care. Surgical treatment of flexible hammertoe deformity reliably corrects the deformity and alleviates pain. Recurrence and progression are common, especially if the patient resumes wearing deforming shoes. Surgical treatment of fixed hammertoe deformity provides very reliable deformity correction and pain relief. Recurrence is rare after appropriate surgical management. Dalmau-Pastor M, Fargues B, Alcolea E, Martínez-Franco N, Ruiz-Escobar P, Vega J, et al. Extensor apparatus of the lesser toes: anatomy with clinical implications--topical review. Foot Ankle Int. 2014 Oct. 35 (10):957-69. [Medline]. Badlissi F, Dunn JE, Link CL, Keysor JJ, McKinlay JB, Felson DT. Foot musculoskeletal disorders, pain, and foot-related functional limitation in older persons. J Am Geriatr Soc. 2005 Jun. 53 (6):1029-33. [Medline]. Barbari SG, Brevig K. Correction of clawtoes by the Girdlestone-Taylor flexor-extensor transfer procedure. Foot Ankle. 1984 Sep-Oct. 5 (2):67-73. [Medline]. O'Kane C, Kilmartin T. Review of proximal interphalangeal joint excisional arthroplasty for the correction of second hammer toe deformity in 100 cases. Foot Ankle Int. 2005 Apr. 26 (4):320-5. [Medline]. Konkel KF, Menger AG, Retzlaff SA. Hammer toe correction using an absorbable intramedullary pin. Foot Ankle Int. 2007 Aug. 28 (8):916-20. [Medline]. Jones S, Hussainy HA, Flowers MJ. Re: Arthrodesis of the toe joints with an intramedullary cannulated screw for correction of hammertoe deformity. Foot Ankle Int. 2005 Dec. 26 (12):1101; author reply 1101. [Medline]. Konkel KF, Sover ER, Menger AG, Halberg JM. Hammer toe correction using an absorbable pin. Foot Ankle Int. 2011 Oct. 32 (10):973-8. [Medline]. Nery C, Coughlin MJ, Baumfeld D, Mann TS. Lesser metatarsophalangeal joint instability: prospective evaluation and repair of plantar plate and capsular insufficiency. Foot Ankle Int. 2012 Apr. 33 (4):301-11. [Medline]. Ellington JK. Hammertoes and clawtoes: proximal interphalangeal joint correction. Foot Ankle Clin. 2011 Dec. 16 (4):547-58. [Medline]. Miller JM, Blacklidge DK, Ferdowsian V, Collman DR. Chevron arthrodesis of the interphalangeal joint for hammertoe correction. J Foot Ankle Surg. 2010 Mar-Apr. 49 (2):194-6. [Medline]. Bouché RT, Heit EJ. Combined plantar plate and hammertoe repair with flexor digitorum longus tendon transfer for chronic, severe sagittal plane instability of the lesser metatarsophalangeal joints: preliminary observations. J Foot Ankle Surg. 2008 Mar-Apr. 47 (2):125-37. [Medline]. Trnka HJ, Gebhard C, Mühlbauer M, Ivanic G, Ritschl P. The Weil osteotomy for treatment of dislocated lesser metatarsophalangeal joints: good outcome in 21 patients with 42 osteotomies. Acta Orthop Scand. 2002 Apr. 73 (2):190-4. [Medline]. Migues A, Slullitel G, Bilbao F, Carrasco M, Solari G. Floating-toe deformity as a complication of the Weil osteotomy. Foot Ankle Int. 2004 Sep. 25 (9):609-13. [Medline]. Painful dorsal callus over proximal interphalangeal (PIP) joint of second toe, caused by long-standing, fixed hammertoe deformity. Physical examination maneuver to diagnose metatarsophalangeal (MTP) instability, wherein examiner attempts to translate proximal phalanx dorsally relative to metatarsal head. In most patients, subluxation is possible; therefore, this test is positive only when it causes pain. Hammertoe shield for treatment of flexible hammertoe. Sling over proximal phalanx straightens toe, while shield under metatarsal head provides padding for painful callus that may be present, supports toe plantarly, and anchors sling.